In the latest monthly NAHB/Wells Fargo Housing Market Index the special questions asked builders about the problems they faced in 2013 and expect to face in 2014. 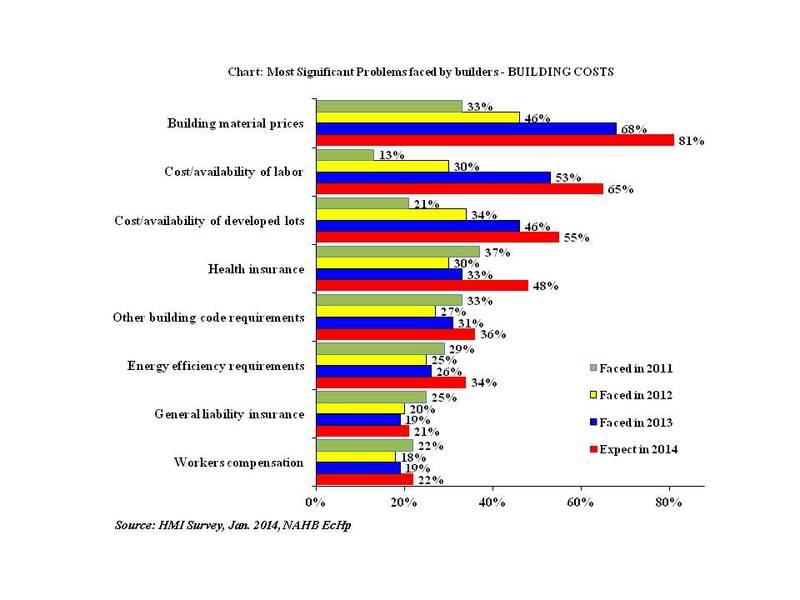 In January 2014 survey, out of 5 different sections with significant problems faced by the builders, one of the sections relates to building costs. Similar questions were asked about problems faced in earlier years, so it’s possible to trace the evolution of problems builders faced in 2011, 2012, 2013 and expect to face this year. According to the latest survey, 81 percent of the builders expect building materials prices to be one of their significant problems expected in 2014, up 13 percentage points from the share who faced that problem in 2013 and substantially up from 46 percent in 2012 and 33 percent in 2011. Second is the cost/availability of labor, according to 65 percent of builders who expect to face it in 2014, up from 53 percent who said they faced the problem in 2013, 30 percent in 2012 and only 13 percent in 2011. More than half of the builders expect cost/availability of developed lots to be a significant problem. This is also up from 46 percent who said they faced the problem in 2013, 34 percent in 2012 and 21 percent in 2011. With the health reforms in place since 1st of January 2014, 48 percent of the builders expect costs of health insurance be a significant problem in 2014. The problems associated with health insurance were slightly less common among builders in 2012 than in 2011, but higher in 2013 where 33 percent of the respondents indicated it to be a significant problem. At this stage, the pace of the housing recovery could be stronger, if the rising construction costs did not emerge as a significant obstacle.